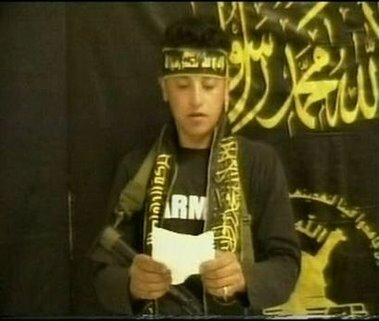 Why do I know Sami Salim Hamad’s name, and why was his picture all over the newspapers? After carrying out a suicide bombing in Tel Aviv Monday, images of this young man appeared widely, including on the NYT front page, inside the LAT and on the Jerusalem Post website. Of all the criteria for a successful suicide mission, I’m not sure where media attention ranks. Given the large perceptual and public relations stakes in the Arab-Israeli conflict, however, it would seems somebody today must be congratulating themselves for all the page views. In my mind, the fact this image got around like it did was not arbitrary. Just like attack planners consider casualties (in this case, the highest toll since August ’04); calendar (reminiscent of the last Passover attack four years ago in Netanya); domestic politics (coming hours after the swearing in of the new Israeli parliament); and sight (The Tel Aviv sandwich shop had been targeted just three months before), it is not unusual to assume similar consideration was also given to the bomber. As the Arab world and various insurrection movements come to utilize satellite broadcasting in a bigger way, is it any surprise someone would take a talent agency, or a casting director’s eye to suicide recruitment? And so I ask the question, why do I know Sami Salim Hamad’s name? Maybe it’s because this is not a 21 year old man, as the family represented and has been reported, but actually a more baby faced boy of about 16. Maybe its because the boy is good looking and telegenic (example 2). Maybe it’s because his expression has so much ambiguity. (Psychologically, ambiguity in an expression compels us to take the subject under consideration, whereas it’s much easier to dismiss a more “set” look out of hand.) Maybe it’s because that gaze forms quite a hook: in part, it’s seductive, longing, intimate, innocent. Maybe it’s because the image has a painterly feel to it. Maybe it’s because the gun strap around the neck of the little soldier seems either too big, or the boy doesn’t know how to wear it. And maybe, it’s because the ARMY shirt — possibly added by the stage managers to establish equivalence with Uncle Sam – emphasizes that this kid looks less like a man, than a fan of war. I imagine some will react to this analysis with disgust, wondering why I would give such consideration to the perpetrators of a heinous act. Ultimately though, I’m just following the interest. To the extent the media space is constantly morphing into an increasingly sophisticated psychological and semiotic battle zone, shouldn’t we be the wiser?